Exotic animals - lions, tigers, wolves, bears, reptiles, non-human primates - belong in their natural habitat and not in the hands of private individuals as "pets." By their very nature, these animals are wild and potentially dangerous and, as such, do not adjust well to a captive environment. Because the majority of states do not keep accurate records of exotic animals entering their state, it is impossible to determine exactly how many exotic animals are privately held as pets. The number is estimated to be quite high. Certainly 6,000 to 7,000 tigers are held by private individuals. The American Veterinary Medical Association, the United States Department of Agriculture (USDA), and the Centers for Disease Control and Prevention (CDC) have all expressed opposition to the possession of certain exotic animals by individuals. Exotic animals do not make good companions. They require special care, housing, diet, and maintenance that the average person cannot provide. When in the hands of private individuals the animals suffer due to poor care. They also pose safety and health risks to their possessors and any person coming into contact with them. Individuals possessing exotic animals often attempt to change the nature of the animal rather than the nature of the care provided. Such tactics include confinement in small barren enclosures, chaining, beating "into submission," or even painful mutilations, such as declawing and tooth removal. If and when the individual realizes he can no longer care for an exotic pet, he usually turns to zoos and other institutions such as sanctuaries to relieve him of the responsibility. However, all the zoos and accredited institutions could not possibly accommodate the number of unwanted exotic animals. Consequently, the majority of these animals are euthanized, abandoned, or doomed to live in deplorable conditions. Every year, a variety of sources provides millions of animals to the exotic pet trade. Animals are captured from their native habitat and transported to various countries to be sold as “pets”. Others are surplus animals from zoos or their offspring. Backyard breeders also supply exotic animals. It is absurdly easy to obtain an exotic pet. Internet sites offer to sell and give care advice. The sellers of these animals, however, make no mention of the state or local laws regulating private possession of exotics, or of the dangers, difficulties, physical and physiological needs of the animals they peddle. The suffering of the animals in the hands of unqualified and hapless buyers appears to be of no concern in the lucrative exotic pet trade. Exotic animals are inherently dangerous to the individuals who possess them, to their neighbors, and to the community at large. Across the country, many incidents have been reported where exotic animals held in private hands attacked humans and other animals, and escaped from their enclosure and freely roamed the community. Children and adults have been mauled by tigers, bitten by monkeys and asphyxiated by snakes. By their very nature, exotic animals are dangerous. Although most exotic animals are territorial and require group interactions, an exotic pet typically is isolated and spends the majority of her day in a small enclosure unable to roam and express natural behaviors freely. These animals are time bombs waiting to explode. Monkeys are the most common non-human primates held by private individuals. At the age of two, monkeys begin to exhibit unpredictable behavior. Males tend to become aggressive, and both males and females bite to defend themselves and to establish dominance. Reported have been many monkey bites that resulted in serious injury to the individual who possessed the animal, to a neighbor, or to a stranger on the street. Non-domesticated felines, such as lion, tigers, leopards, and cougars, are commonly held as pets. These exotic animals are cute and cuddly when they are young but have the potential to kill or seriously injure people and other animals as they grow. Even a seemingly friendly and loving animal can attack unsuspecting individuals. Many large cats have escaped from their cages and terrorized communities. Several of these incidents have resulted in either serious injury to the persons who came in contact with the animal, or the death of the animal, or both. Reptiles, including all types of snakes and lizards, pose safety risks to humans as well. Many incidents have been reported of escapes, strangulations, and bites from pet reptiles across the country. Snakes are the most common "pet" reptiles - about 3% of U.S. households possess 7.3 million pet reptiles - and have the potential to inflict serious injury through a bite or constriction. 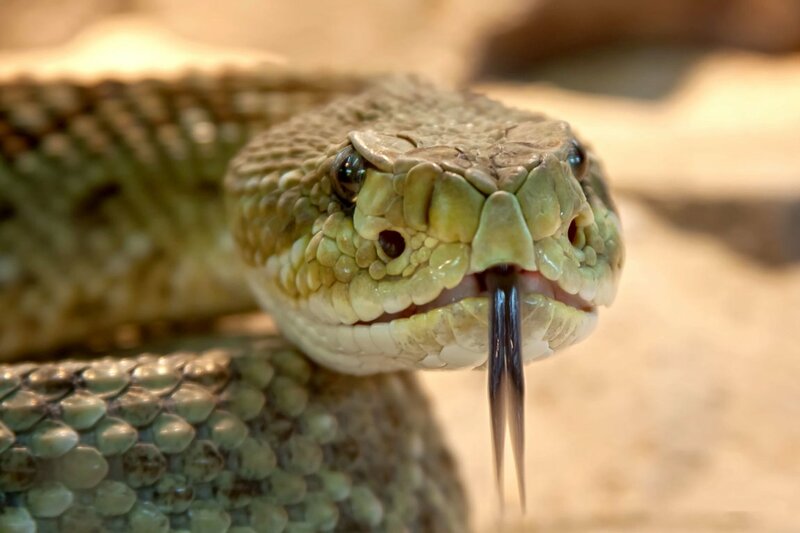 More than 7,000 venomous snake bites are reported annually in the United States (it is uncertain how many of these snakes are pets), 15 of which result in death. Exotic animals pose serious health risks to humans. Many exotic animals are carriers of zoonotic diseases, such as Herpes B, Monkey Pox, and Salmonellosis, all of which are communicable to humans. 80 to 90 percent of all macaque monkeys are infected with Herpes B-virus or Simian B, a virus that is harmless to monkeys but often fatal in humans. Monkeys shed the virus intermittently in saliva or genital secretions, which generally occurs when the monkey is ill, under stress, or during breeding season. At any given time, about 2% of infected macaque monkeys are shedding the virus. A person who is bitten, scratched, sneezed or spit on while shedding occurs runs the risk of contracting the disease. Monkeys rarely show any signs or symptoms of shedding, making it nearly impossible to know when one is at risk. Monkeys have also been known to transmit the Ebola virus, monkey pox, and other deadly illnesses. Bites from non-human primates can cause severe lacerations. Wounds may become infected, with the potential to reach the bone and cause permanent deformity. Around 90% of all reptiles carry and shed salmonella in their feces. Iguanas, snakes, lizards and turtles are common carriers of the bacterium. Reptiles that carry salmonella do not show any symptoms, thus there is no simple way to tell which reptiles play host to the microbe and which do not, because even those that have it do not constantly shed the bacterium. Salmonellosis associated with exotic pets has been described as one of the most important public health diseases affecting more people and animals than any other single disease. Salmonella infection is caused when individuals eat after failing to wash their hands properly after handling a reptile or objects the reptile contaminated (this can be either indirect or direct contact with infected reptiles). Salmonella bacteria do not make the animal sick, but in people can cause serious cases of severe diarrhea (with or without blood), headache, malaise, nausea, fever, vomiting, abdominal cramps, and even death - especially in young children, the elderly, and those with immune-compromised systems. In addition, salmonella infection can result in sepsis and meningitis (particularly in children) as well as invade the intestinal mucosa and enter the bloodstream causing septicemia and death. The sale and possession of exotic animals is regulated by a patchwork of federal, state and local laws that generally vary by community and by animal. Individuals possessing exotic animals must be in compliance with all federal laws as well as any state, city and county laws. Three federal laws regulate exotic animals - the Endangered Species Act, the Public Health Service Act, and the Lacey Act. However, these laws primarily regulate the importation of exotic animals into the United States and not private possession. Under the Endangered Species Act (ESA) it is illegal to possess, sell or buy an endangered species regardless to whether it's over the Internet or not. The ESA does not regulate private possession, it merely allows the U.S. Fish & Wildlife Service (USFWS) to prosecute individuals who illegally possess endangered species. "Generic" tigers (subspecies that have been interbred) are not considered endangered and, as such, can be legally bred and possessed. The Public Health Services Act prohibits the importation of non-human primates and their offspring into the United States after October 1975 for any use other than scientific, educational or exhibition purposes. However, unless it can be proved that the non-human primate in question or his ancestors entered the country after October 1975, the Act is unenforceable. Most individuals are unaware of their animal's heritage and it is next to impossible to trace the animal's origin. The Lacey Act allows the U.S. government to prosecute persons in possession of an animal illegally obtained in a foreign country or another state. Again, this Act does not regulate private possession, it merely allows the USFWS to prosecute individuals who have illegally obtained exotic animals. State governments possess the authority to regulate exotic animals privately held. Laws vary from state to state on the type of regulation imposed and the specific animals regulated. Some states ban private possession of exotic animals (i.e. they prohibit possession of at least large cats, wolves, bears, non-human primates, and dangerous reptiles); some have a partial ban (i.e. they prohibit possession of some exotic animals but not all); some require a license or permit to possess exotic animals; and while the remaining states neither prohibit nor require a license, they may require some information from the possessor (veterinarian certificate, certification that animal was legally acquired, etc.). Many cities and counties have adopted ordinances that are more stringent than the state law. Generally, the city or county have determined that possession of certain exotic species poses a serious threat to the health, safety and welfare of the residents of the community as a result of a recent attack in the area, an escape, or by the virtue of the animals' physical attributes and natural behavior and, as such, adopts an ordinance regulating or banning private possession. Some people often sidestep existing laws or bans by becoming licensed breeders or exhibitors under the USDA and/or by having their property rezoned. In addition, individuals often move out of city limits or to a new state once a restriction or ban is imposed. For the animals' sake and for your health and safety, do not buy exotic animals as "pets." If you observe an exotic animal being abused, living in deplorable conditions, etc., report it to the appropriate animal control agency. Educate others. Write a Letter to the Editor. Share information with friends and family. Support legislation at all levels to prohibit private possession of exotic animals. Find out how your state, city and county regulates private possession of exotic animals. If your state, city or county does not prohibit private possession, contact your state senator and representative or your city and county council members and urge them to introduce legislation banning possession of exotic animals.